That is gorgeous! Did your mother make that? Yes, my mother made it - it's a Maggie Walker pattern called Roseville. (Roseville is the pottery, apparently - I'd never even heard of it.) She worked on the little blocks for months and months before she even got to that big block in the middle - and the big block had 300-some pieces, I remember that! It was a huge labor of love. The quilt is beautiful. Definitely deserves a place to be admired. But - as coming from the region where the nutcrackers originated - I have to tell you unfortunately that they are def. not original ... But interesting nonetheless. 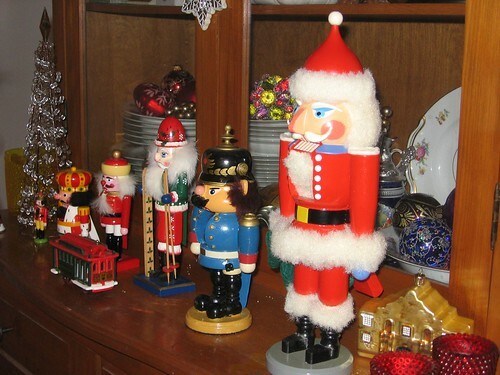 Oh, I never imagined that the nutcrackers were handmade ones or anything. Some of them came from Germany - but they were definitely the kind made for tourists. The others came from China, I think. I just kept the ones that appealed to me. 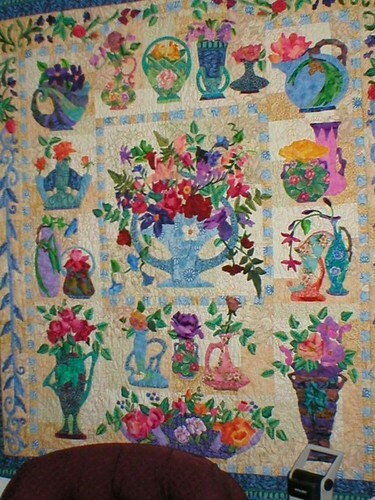 Love the quilt that you got from your mother. What a treat to have hanging in your home!